Here I am back again to the Yarn along and this week I have something to show too. We came back from our trip last Tuesday night and as I don’t knit during holidays away (as least if I travel with Michael) I didn’t have anything to show you. Well, as I realized later on Ginny was not hosting a Yarn along anyway because she had a baby. Congratulation to you and your family, Ginny! And this crazy woman is hosting the Yarn along this week already again. Well, back to my knitting. Coming back I still had the rest of the week off and when I had sorted out our luggage and put on a few washing machines, I started knitting like crazy. I decided to finish off a quick side project that I had started in the week before our holiday, my mittens. I think they look quite cool. And I’m wearing them ever since I finished them. They are so nice, cosy and warm! Then I knew if I wouldn’t work on my brother’s Christmas jumper, it wouldn’t get finished in time. So I worked on the last piece that needs to get finished, the front with the colourwork. Have you ever had the feeling something you did was just wrong? Not the pattern, not the size, not even the yarn, but the thing itself? I know I said it before but do confess again: I hate colourwork. Knitting it is super excausting. But how can I stop now? After lots of work on it on the weekend I’m about 50 rows from being finished (plus the collar) and of that only 30 are still colourwork. And I promised my brother to do that so there is a fixed date when it needs to be mailed to arrive for his birthday. But if it wasn’t for that, I would have stopped ages ago. Hope he appreciates the love that I put into that, because it required a lot of love to go on knitting. 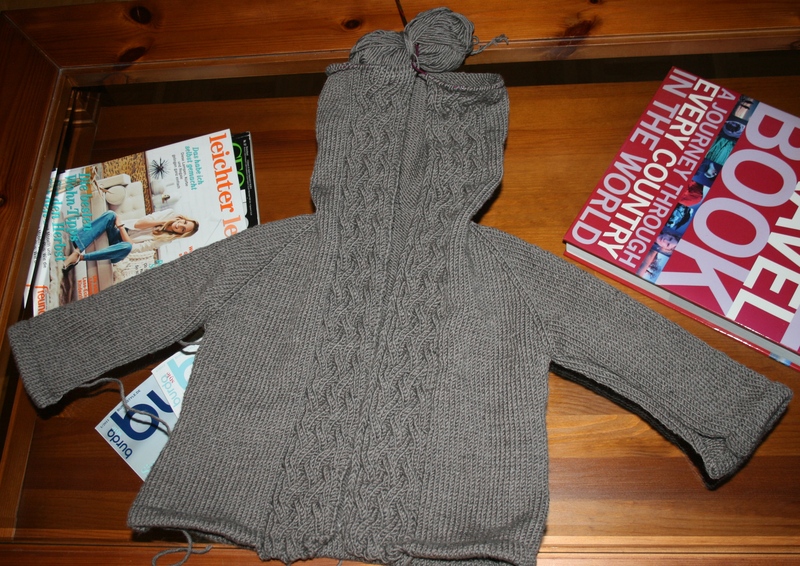 Next I knitted a few rows of my third Phoebe’s Cardigan but turned to the Toddler Cardigan instead. I was getting close to finishing on Monday and was already in the mood to swatch for my next project (some how I seem to need the swatching for new projects before the first project is finished to get the energy to finish the first one). And when I finally found a pattern I liked I realised I had something else due even before my brother’s Christmas Sweater: the Secret Santa Swap Gift! The email with my Swap Partner’s Details came a day or two before we went on holidays. I remember checking out patterns for inspiration and then I forgot. So when I realised that it is supposed to go into the mail in about 2 weeks I ran for my stash and after some quick swatches, I’m working on my gift. Of course I can’t tell you what it will be or who it’ll be for (I only know a name and address and very few keyfacts anyway). 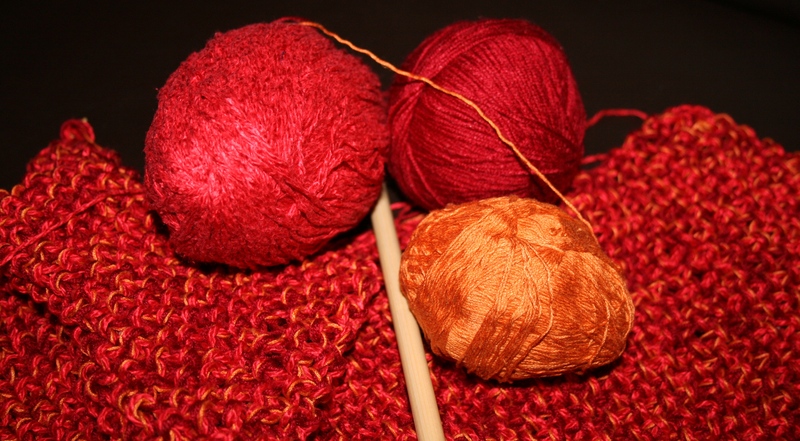 But I show you a picture of the structure and colours I chose: I mixed a thin orange cotton yarn, a red shiny silk and some bordeaux read acrylic mix – it’s the right ball of yarn and in reality it is darker red – and am knitting a simple seed stitch. It looks and feels really good. tNow what about reading? I read a lot during our time away. It were only two books which is not much for me during a holiday where one week as mainly relaxing at the pool with a book in your hand. 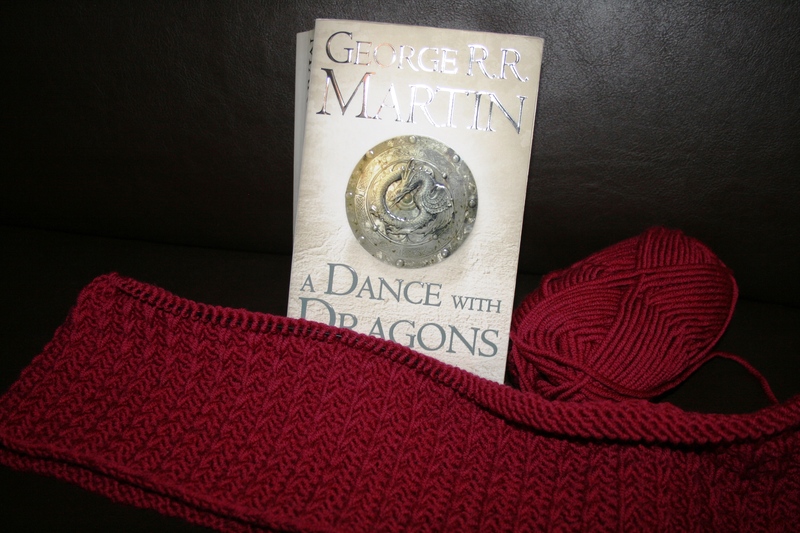 But after a quick read through the third volume of Jo Nesbo’s Harry Hale crime stories, I started “A dance with dragons”, the fifth book from the “A song of Ice and Fire” series and those ones take forever when I read them. And here I am, having finished it in less than two weeks! I have to say this one has a lot of twists and turns in it. Some more secrets are lifted, new ones appear and of course he breaks off some of his stories just so that I’ll definitively will buy the next book too because I want to know how the story advances! Now I’m back to “Catching Fire” and “Des Mauren letzter Seufzer”. This entry was posted in Knitting & Crocheting and tagged Cardigan, Knitting, Mitten, Sweater, Yarn Along by kathatravelling. Bookmark the permalink. 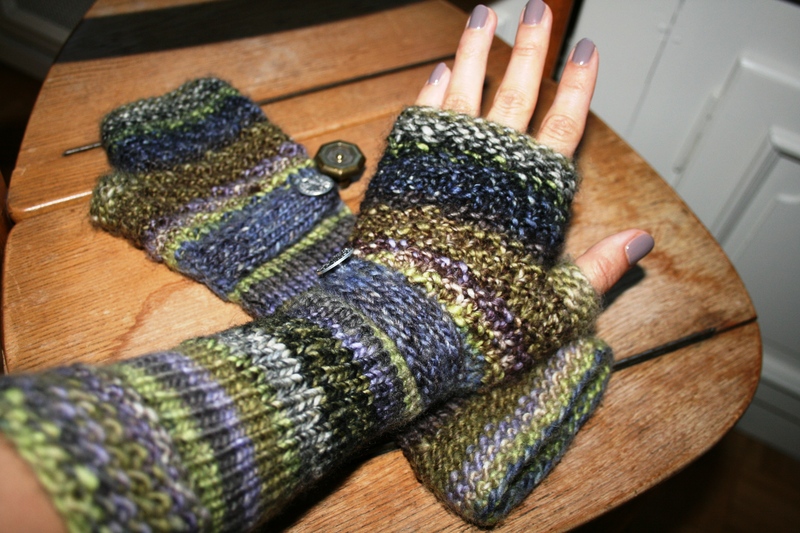 I love the mitts and all the rest of the knits. The reindeer is great. 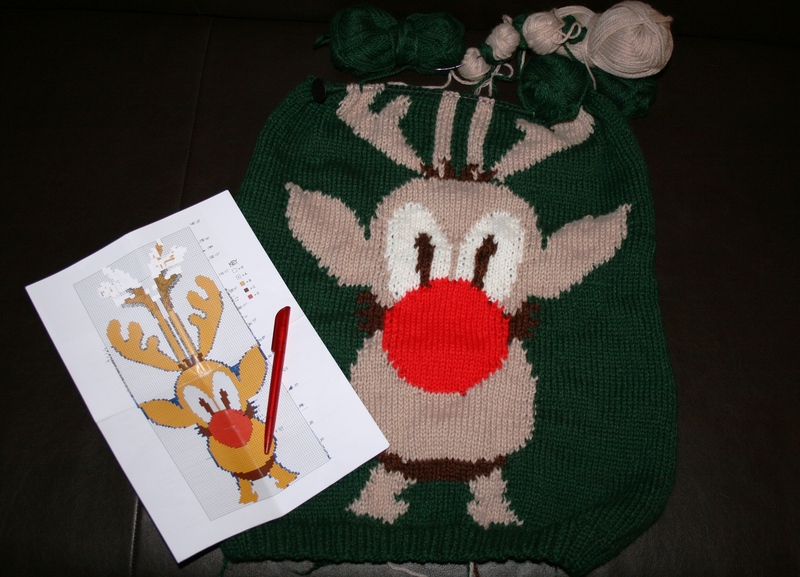 i hate intarsia…i hate intarsia…i hate intarsia…(get the idea?) Most other colorwork is OK….but yuck, yuck, yuck on intarsia. Brother better LOVE the love that went into that sweater! You are a busy knitter! Those mittens are beautiful. I am in love with that yarn! The Christmas sweater is adorable – so much work! I tried color work like that once and swore it off. You are a good sister! I’ve done colorwork and most of the time it does take up a lot of time. Lately I love simple fast knitting. Great projects!